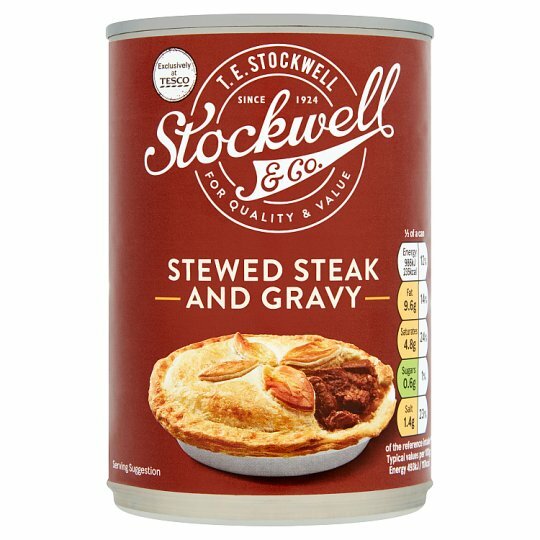 INGREDIENTS: Beef (65%), Beef Stock [Water, Beef Extract, Yeast Extract, Chicory Fibre, Salt, Sugar, Cornflour, Onion Concentrate, Black Pepper], Tomato Purée, Wheat Flour [Wheat Flour, Calcium Carbonate, Iron, Niacin, Thiamin], Modified Maize Starch, Cornflour, Salt, Ground Bay Leaf, Black Pepper. MICROWAVE 800W 3 mins/900W 2½ mins. Heat on full power for 2 mins (800W) 1½ mins (900W). Stir, then heat on full power for 1 minute (800W/900W). Leave to stand for 1 minute after heating. Stir well before serving. Instructions: HOB 4-5 mins. Empty the contents into a saucepan. Heat gently for 4-5 minutes, stirring occasionally. Do not allow to boil.